But now let’s have a look at that, what happened at the meetup. In peak times about 70 people registered for this event. Over 50 of them showed up finally. Compared to the “normal” usergroup meetings in the “Gleiswirtschaft Giesing” with about 10 – 15 participants this was a real “boost”. The evening started with beer and soft drinks accompanied by small sandwiches, tasty salads and bread spread. The warmup took a little bit longer as planned, but this is a good indicator that the mood within the community is good. Special guests were Olivier Dobberkau (president of the TYPO3 Association) , Mathias Schreiber (CEO of TYPO3 GmbH) and Benjamin Kott (TYPO3 Core Team). Our industry does not respect tradition – it only respects innovation. According to Christian the culture of Microsoft it being turned upside down. As a result the company is now open to other technologies and open source software. One evidence is, what is possible with the cloud solution of Microsoft, Microsoft Azure. Many open source OS and components are already available there. The adaption of new technologies has much to do with the trust that (potential) customers put into the provider and the technologies. Especially for Germany trust in data protection is a big topic. Microsoft addressed it with the product “Microsoft Cloud Deutschland”. The technical and legal setup should keep all data secure under german law. Other regions with other legislative settings are also possible. Afterwards Daniel Kreuzhofer gave us an introduction the structure of the services an explained the necessary components of an WebApp. Interesting to see was, which differences are there between the Microsoft Azure cloud solutions in the different regions and how it is possible to combine them. Both, Christian and Daniel, are part of the Unit “Developer Experience & Evangelism (DX)”. This unit has about 30 members and should support all, who want to build products upon MS Azure. The “thing” for me is, that Microsoft is now not only about pushing licenses and documentation, and collecting money, but also about caring (potential) users of Micrsoft services. firing up a new branch and instance takes just a couple of minutes. All dependencies are defined in a yaml file, which any developer can write without any knowledge of the underlying os. The services are based on a git repository and each commit to it leads to a new deployment to the branch specific instance. An example repository is available on GitHub. In the third part Peter Kraume showed us the new and shiny Form framework and its flexibility. Thanks to Tritum a completely new form extension is now available in TYPO3. The roots for this activity are going back several years. Tritum wanted to refactor and enhance the form solution in TYPO3 6.2LTS. They put much effort in it. After the enhancements where published in TYPO3 7.4, it became clear that this is a dead end. So the (back then) up to date solution was dropped in favor of a complete new rewrite. The results can be seen in the current master … and what Peter showed us it looks really fine and usable. The slides are available at slideshare. The third part of the evening was a short trip through the new Microsoft offices. Unfortunately I was in discussions with some other people, so I missed it and cannot provide some pictures of the bureaus and conference rooms. If you have any pictures taken and want to share them, please drop me a note. 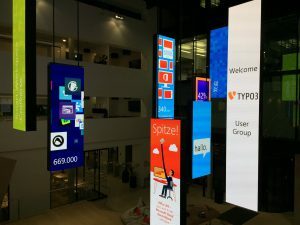 I am very astonished what transformation Microsoft is undergoing: Embracing open source, leaving behind old enmities and creating perspective and dynamics for the next years. The post image was published on Pixabay by designerpoint under the CC0 Public Domain. Modified using the service Pablo on Buffer. 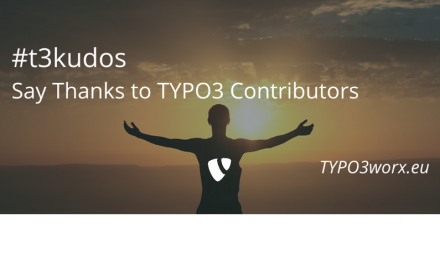 PreviousGuide to TYPO3 Documentation – Part 3: Contribution and ReST Helpers! Thanks for your report and your kind words about EXT:form. Just wanted to mention that the extension is called “form” and not “forms” ;) No worries. Thanks again and all the best, Björn.